Well, the last sea turtle nest of the season on my stretch of beach was due for evaluation this week, so I rolled my bike out to ride down to the beach late Wednesday after work. I walked in a little over a mile to where the nest was located, and snapped a shot before I started the evaluation. This nest had taken on some high surf during the 2 months it was incubating, so the poles were leaning, and the wind had snatched the yellow caution tape away from where I had tied it and re-tied it. 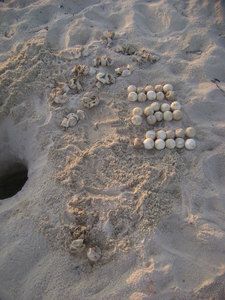 But, it turned out to be a pretty good hatch-out - 60 eggs hatched, and 33 were unhatched - all of them located toward the bottom of the nest chamber, probably drowned in one of the high surf events. I pile up the eggshells in groups of 5 to count them a little easier, and line up the unhatched eggs in 2s, as you can see. Then, once everything is measured and recorded, all the eggs and eggshells go back into the nest chamber, and are covered up to finish decomposing and nourishing the beach, just as would have happened naturally. As I headed back, I snapped a few photos - the shells were fantastic that afternoon, and the sunset was beautiful, no matter which direction you looked. 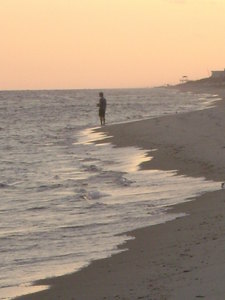 This person came out to try their hand at a little late afternoon fishing. Even though I don't fish, this looked pretty darn tempting. What a way to end the day. 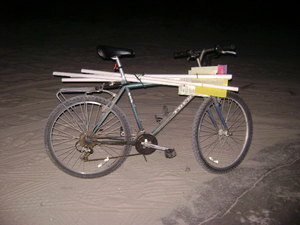 And, there was my trusty rusty bike waiting for me at the end of my walk - I strapped on the poles and got ready to head back home. I always hate to see the end of turtle nesting season - but it's only 7 months before they begin to nest again! !